It was only launched 19 months ago, but Purplebricks is already eyeing a stock market flotation before Christmas. Estate agents generally fall quite low down on the list of characters people wouldn't mind being stuck in a list with. There are few sectors more ripe for disruption by new online players. So far that has been pretty limited. Rightmove and Zoopla (and now OnTheMarket) have become the main source of the residential property industry's leads, but the traditional high street estate agent remains a necessity for most homesellers. One of the most promising ventures attempting to unsettle the status quo is the relatively young upstart Purplebricks – launched in 2014 by former lawyer Michael Bruce. It's now eyeing a stock market flotation before Christmas, aiming for a valuation of around £240m. 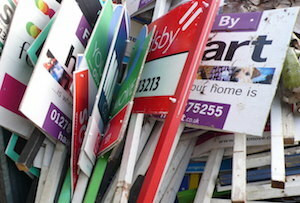 Trading in Purplebricks' shares is expected to start on December 17, the company said. The company will float 20 to 25% of its shares making it the first of several digital start-ups in the sector to achieve a public listing. Previous backers include renowned UK fund manager Neil Woodford (who injected £7m into the company last year) and Wonga founder Errol Damelin. Corporate finance boutique Zeus Capital will act as its sole broker and nominated advisor, with a dozen or so institutions buying most of the floated stock. The draw of Purplebricks has been its promise to provide fixed fees far lower than those charged by a traditional agent, currently set at £798 including VAT, rising to £1,158 for the more extortionate London postcodes. Purplebricks and similar firms like emoov and HouseSimple offer support in providing valuation, professional photography along with help in arranging viewings and negotiations. But traditional agents tout the value of expertise and tailored knowledge a local expert provide as something online competitors lack – similar to how solely bricks and mortar retailers would say the value of in-store employees can’t be rivalled by online competition. But despite that many sectors have been, and continue to be, disrupted by online competitors – many of which provide an agile and simplistic model that trumps the traditional players. Not to mention, the human factor is often a deterrent (and very much an irritant) for people on the hunt for a house. Purplebricks has attempted to cover all bases in its attempt to make further inroads into the established property sector, with a network of local agents providing face-to-face services (though it doesn’t run branches). While only commanding around 5% of the market share, online agents are beginning to make their presence felt – which is surely a good thing for those who flinch at the sight of the familiar green and yellow Mini, signalling the imminent arrival of a Foxtons’ estate agent.